Hey guys! How y’all doing? I have something special for you today. As we all probably know, first Kobe’s sneaker after his retirement was really a mess, straight out trash performer in almost all areas. It left behind tons of unhappy consumers including me too. 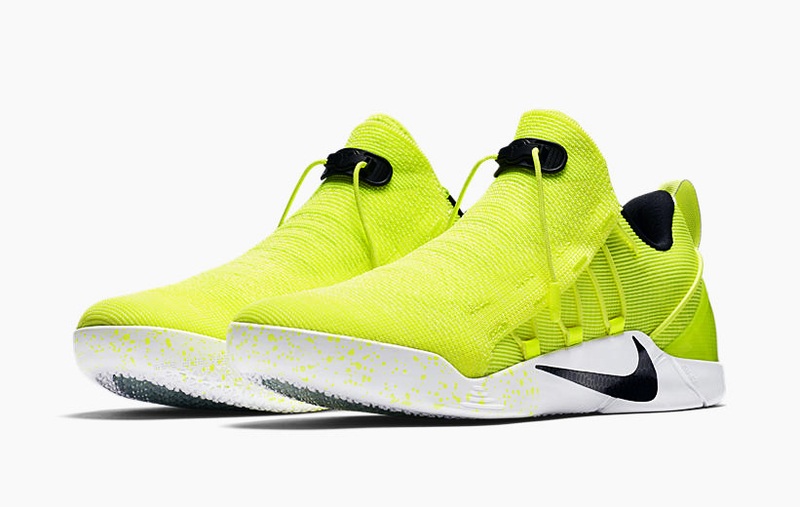 So, after a while Nike released completely redesigned and hardly recognizable Kobe A.D. NXT version – new look, different performance & higher price tag. 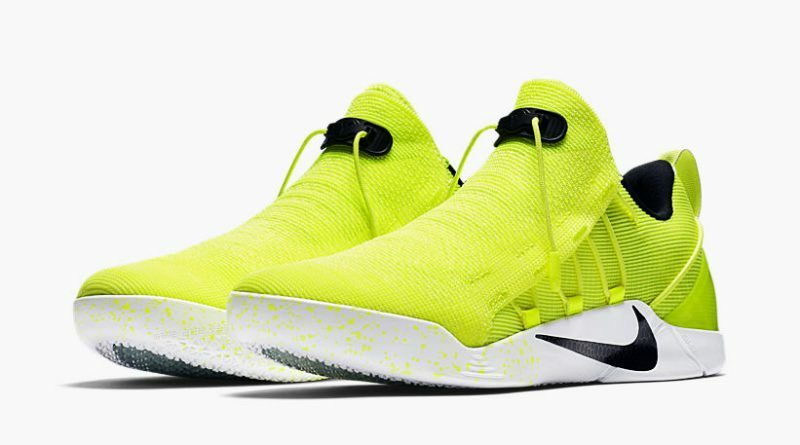 I feel like this NXT version is like an apology gift from Nike for making that huge mess in the Kobe A.D. model. However, the main question is… Do they actually are able to offer more enjoyable experience for us? Or the NXT will be another L for Nike? Let’s find out! 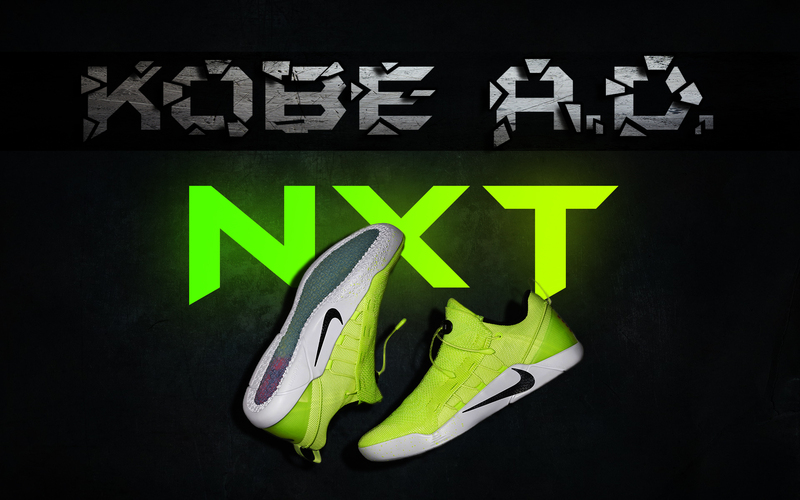 Welcome to my Nike Kobe A.D. NXT Performance Review! Before diving into this performance review I highly recommend you to read my performance review on the original Kobe A.D. to just get the idea about what the hell I’m talking about, because here will be a lot of comparisons to the older model. 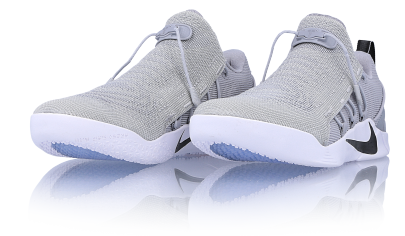 Almost the entire NXT bootie is covered with super nice mesh as the new shroud in forefoot area is made of Flyknit coated in TPU. Now, the A.D. has that stiffer mesh upper which lacks of comfort & stretchability, that’s why I didn’t like that setup. Of course, after a break-in time mesh became softer and less forgiven but still I wasn’t completely satisfied as with the NXT’s upper. This material combo is quite softer, more stretchable (that means more suitable for wide footers) and overall your foot just has more freedom, more room for natural feet movements. And this is how I felt first time wearing them, so that means zero break-in time is needed. Although, while the upper is softer, you’re not losing any support due to solid support features and, of course, that reinforced shroud. I will cover this new innovation in the SUPPORT section – stay tuned! I was extremely pissed off about cushion department on the regular A.D. I felt like wearing a pair of bricks – little to none impact protection, okay responsiveness & decent court feel. As I said then, every part of the sneaker for some reason felt stiff to me and you hair that from a heavy player who puts huge amount of force and weight on a shoe. Thank God they fixed this issue too. 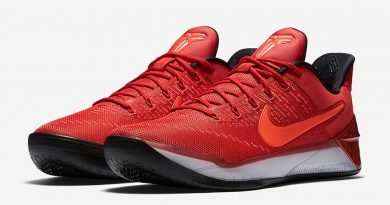 The Kobe NXT borrowed 11’s cushion setup – drop down midsole, Lunarlon and the ZOOM air unit in the heel area for better impact protection. Playing in these was a completely different story. I received enough impact protection & bounce, especially in the back where the air unit is. I mean, this isn’t the best cushion ever but it was enough for me to enjoy playing them. Lunarlon in this setup is soft & bouncy, so you’re also getting solid impact protection in forefoot/midfoot areas without losing any court feel. Guards or even bigger guys like me will definitely be satisfied with what they offer in the cushion department. They kept the same outsole with the same traction pattern as on the regular A.D. The only visual difference is fully translucent rubber – the A.D. had that semi-translucent outsole. We already know, that Nike is not very good at making clear rubber outsoles perform at the same level that regular ones do. Surprisingly, traction performed way better, no super crazy changes but you can definitely feel it nonetheless. Maybe they changed rubber compound or something, who knows. Dusty courts still was a problem for this model, but not as hue as on regular A.D. – gaps between each groove accumulated dust less and the overall performance was visibly improved by decent amount. I was forced to wipe my soles every so often to maintain good traction with the floor. However, on clean courts or semi-dusty courts the NXT picked up hardwood exceptionally well – nice move coverage, stopping power. I was able to perform cuts and quick direction changes without any major slippage problems. Overall, I was pretty happy with the outcome despite that traction is still delicate to dusty courts. Unfortunately, I’m not recommending you to use them outdoors. Unless you want to throw away $200 after a few months of playing outside, I don’t think you do. I couldn’t be more happy and satisfied with how awesome the NXT fitted me. All Kobe’s signature line models have that famous super snug fit. That’s why not everybody is capable of pulling them of, especially wide footers – almost all past models were big no no’s for them. However, the NXT has probably the widest forefoot area from all of them, that’s why they are now wide foot friendly. DOPE! Let’s talk about sizing real quick. Just go true to size if you have a regular foot. I went ½ up and they fitted me perfectly, so wide footers should do the same. Despite that wider forefoot, the NXT still offers super snug but at the same time comfy fit – amazing midfoot/forefoot containment, strong heel lockdown, one-to-one fit and heavy padding inside. That massive padding is always on point, love it! 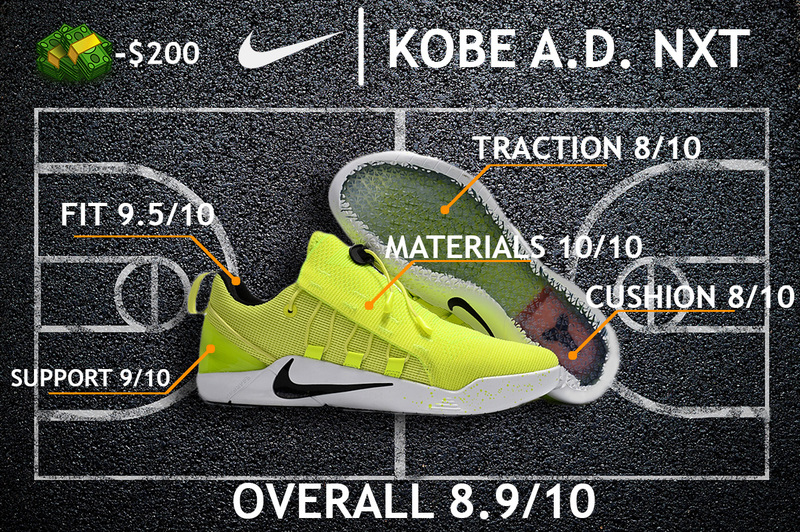 The Flyknit piece on top of the upper gave me more support & containment in the forefoot area then the regular A.D. did. So I can prove that the new shroud piece is working quite well. Also, main support features are there too – an internal heel counter, Flywire cables and outriggers in the heel and forefoot for killer stability. The lacing system is actually connected with the shroud piece underneath and when you tie the laces, that Flyknit piece nicely hugs your foot and keeps it locked in. For me personally, the ankle lockdown was phenomenal. If you’re looking for killer ankle support then the NXT is probably one of the best choices for you man. 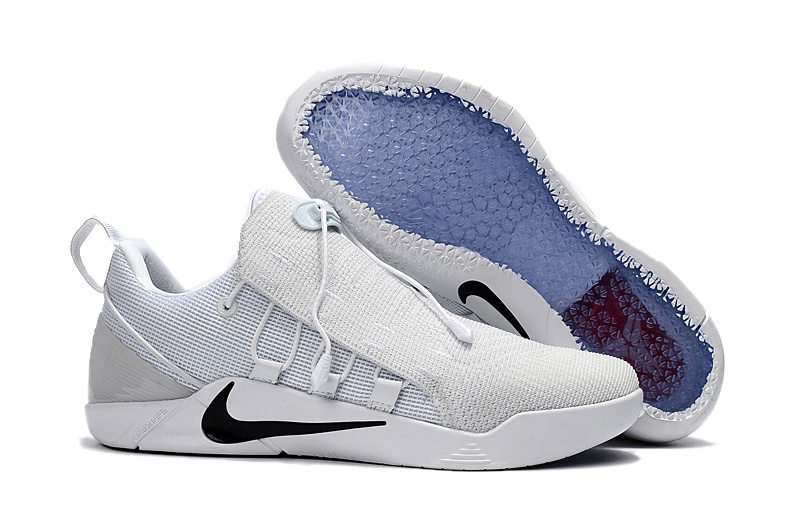 The Nike Kobe A.D. NXT clearly improved in each and every aspect from what we received in the older A.D. – responsive cushion setup with decent amount of impact protection, slightly better support, more enjoyable fit and premium materials. I mean, you’re getting a full package of newest technologies and top tier performance. However, they are priced at $200… When you think about it, that’s a huge price to pay for a GOOD but no great hoop sneaker. Let’s be honest, you can easily grab a beastly performer for a $110-$140 that will be better than the NXT in almost all aspects. Although, if you’re willing to spend this amount of money for basketball a shoe, then go ahead and do it. You will not be disappointed by any means since it was a super fun shoe to play in. At the end of the day, it’s nice to see Kobe’s signature line back again and competing at the highest level. Hope you enjoyed my Performance Review on the Nike Kobe A.D. NXT. ← adidas Crazy Hustle REVIEW – Another Successful Budget Model?